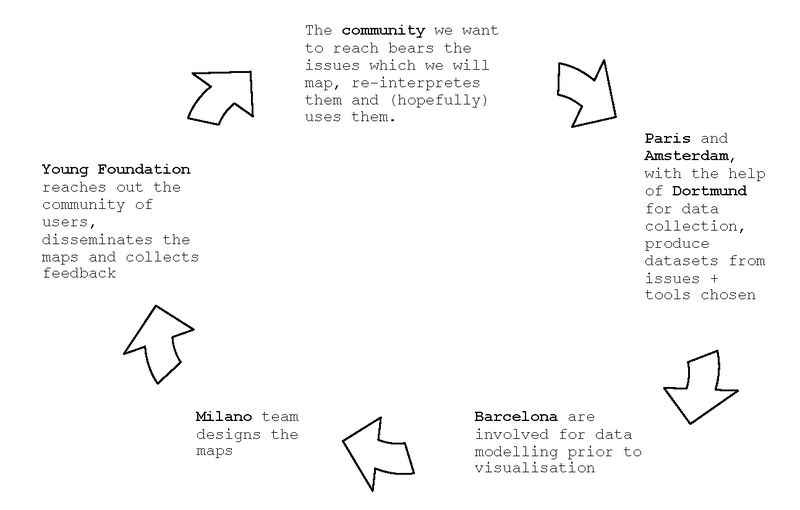 Referring to the post from Milan on Visual reports for climate changeI took the reports prepared by the POLIMI students as a set of samples to relate the spatial scale of decision-making (global to local) on the one hand to the issues that are covered by the climate change strand of the EMAPS project on the other hand (focus on adaptation but also links to mitigation and other environmental issues). Although the figure below is from a methodological perspective not correct (the values on the axis of ordinates are not continuous) it shows that the majority of discourses that seem to be preferably analysed by the students are at the national, international or global scale whereas – on the other hand – the local and regional discourse analyses do not cover adaptation. This of course mainly depends on the selection of discourses as well as on the selection of discourses data (mainly online based). However, this result is not surprising for me also from another perspective: Rather few discourses about regional or local climate change adaptation exist yet – climate change adaptation is still far away from being a mainstream issue. It is a topic that is new for regional and local decision-makers and it is (especially in developed countries) often not approved yet because extra costs are expected from tackling this problem and further it might lead to a negative image of a region as being vulnerable. Thus, there is some potential for added value to link climate change adaptation controversies with regional and local decision-making. 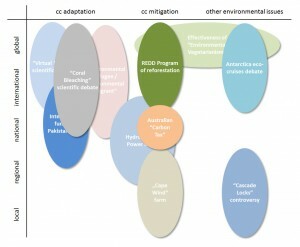 Further, I took some of the scientific discourses on climate change adaptation (see potential controversies we have identified so far, e. g. post on Background information to some climate change adaptation controversies) and related them also to the different spatial scales as well as to groups or spheres of actors (science, GOs, NGOs, the public). The picture shows – against the background of our own cc adaptation research experiences – in a very generalised manner at which spatial level the results of the discourses are relevant for which group or sphere (also in this figure the axis of ordinates has discrete values and therefore does not represent continuous relations). 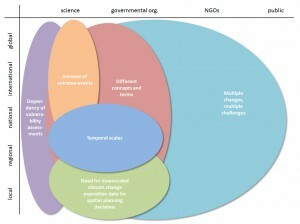 It is not surprising that most of these selected scientific discourses are carried out in science with strong relevance and relations to governmental organisations as the latter often carry out scientific studies by themselves or determine the design of research by formulating research programmes or terms of references. The discourses stretch from actors at the global to those at the local level. However, there are also some topics that are of special relevance for regional and local decision-makers. Summarising, from the perspective of applied research in climate change adaptation it would be very promising for the EMAPS project to link the discourses analysis/controversy mapping to regional and/or local decision-making processes and to identify topics that meet stakeholder and decision-maker needs at the regional and/or local level. We compiled some background information about these topics in a short paper. When reading it you will see some overlapping with Tommaso’s list in the workshop survival kit (pp. 10-12). However, not all topics that Tommaso lists are described in the paper. Nevertheless the paper could give some input to our discussion during our project meeting on 14 June 2012 in London. In order to identify some specific sub-controversies we may want to focus on in the rest of the project, we are launching our crawling/scraping spiders. To do so, we have looking for a query that would be both ‘exhaustive’ (allowing us to find all the pertinent websites and scientific articles) and ’specific’ (allowing us to find just the pertinent websites and scientific articles). If you think that this query may be improved, please comment this blog and tell us how. 1. Procedures for adaptation funding (how the money is collected, how the money is spent). 2. Indicators of vulnerability and adaptation capacity. 2a. Role of climate models and meteorological forecast in the choice/implementation of adaptation policies. 3. Which governance/policy instruments are to be used to choose/implement adaptation policies. © 2011 EMAPS | Powered by WordPress | Theme 'Sirup' by 1000ff | 41 queries 0.272 sec.